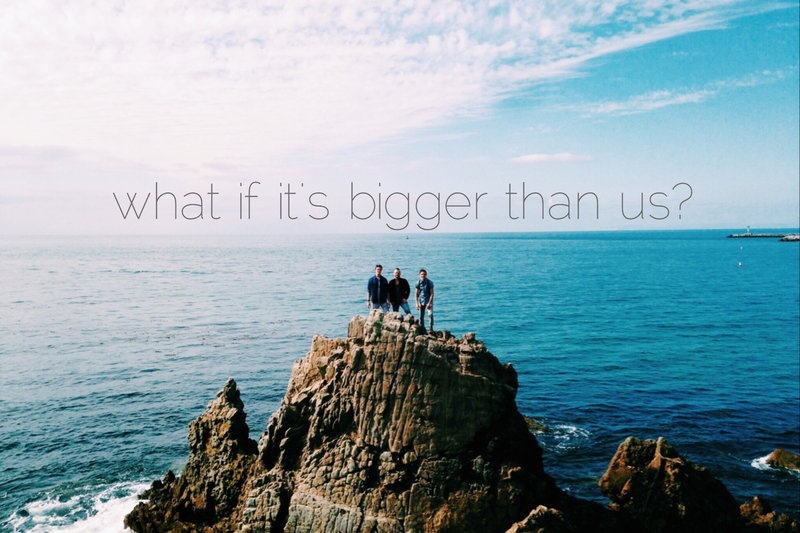 what if it’s bigger than us? I have a friend in North Carolina who was born in communist Romania. Her dad was a business man, and he would come over to the states every once in a while for work. As Romania began to get more and more oppressive, her parents decided they wanted to try and get their family to America permanently. They decided that the next time her dad came over for work, he would stay, and her mom would follow as soon as she possibly could with her daughters. Well it didn’t take long for the government to have them figured out, so it became very difficult for her mom to get the rest of the family out of the country. Every week she would go to the city official she needed to get permission to leave from, and every week he would deny her. She would simply say, “Thank you, I’ll see you next week.” Weeks and then months, and maybe even years went by, and she would show up every single week and ask the same question, and finally, he gave her the OK. I don’t honestly remember how long it ended up taking, but it was years before my friend and her mom & sister finally got to the states to be with her dad, and to be a complete family again. She would end up growing up to know Jesus and give her life to ministry. She’s brilliant, she speaks several languages and today she’s a counselor. Before becoming a counselor, though, she was on Young Life staff, and she went down to Costa Rica for the summer in 2008 to translate for missions teams. She translated for a team from Tennessee for a few weeks, and she poured into the lives of the girls on the team. I happened to be one of them. I was about to leave for Arkansas to play college soccer, and I was scared and questioning a lot of things, and she spoke truth into me in ways that carried me through that first year of college. She lived in Raleigh at the time, but she moved to Charlotte a year later, the same summer that I met my best friend while working at Young Life camp, who happened to be from Charlotte. So ever since 2009 I’ve taken trips to Charlotte once or twice a year, and every time I get to spend time with this friend of mine that I met in Costa Rica. After being in Charlotte last month, and staying at my Romanian friend’s house, I was so moved by the revelation of what had to happen in order for us to know each other. I had known it was crazy that we met in Costa Rica, and I had known it was crazy that Charlotte became somewhat of a second home to me around the same time she moved there. What was blowing my mind this time, though, was hearing her tell Noland her family’s story that I’d heard before, and realizing that if her mom hadn’t fought the way she did, I wouldn’t know her. And my walk with Jesus had taken a pivotal turn when I met her in 2008, so I couldn’t imagine where I might be if we hadn’t met. It blows my mind that God orchestrates things the way that he does. That she had to move from Romania and then grow up in North Carolina, end up on Young Life staff so we could meet, then leave staff to go back to school for counseling in Charlotte so we could spend time together once or twice a year. Oh, and that I would meet my best friend who was from Charlotte in the middle of all that, having a reason to visit often. It’s crazy to me that God just lines things up that way. But what’s even crazier is that none of it would have lined up the way it did if her mom hadn’t persevered through years of being denied a promise, in order to see God bring to completion what she believed He had spoken. What blows my mind is that the trials I think are just mine to walk through carry the weight of every attached promise and relationship for generations to come. What if the battles we’re fighting are bigger than us? What if God invited you to co-labor and fight with Him for something that feels like it’s only holding you back, but really, when you finally get your breakthrough, it will release new promises for generations to come? What if it’s going to unlock things that change hearts and lives that you may never meet, but that started with you continuing to ask, every single week, until you saw God do what He promised? I don’t know what you’re walking through or what you’re facing opposition from in your life right now. I don’t know how long you’ve been denied a promise that you really believe God has given you to fight for. But I do believe that it matters that you keep showing up and asking. I’m so thankful for that woman who fought for her family. I’m so grateful that decades later I got to have my life changed by a woman who spoke truth and life into me in a critical season of my life, simply because her mom never gave up hope. The hope God is asking you to cling to today is meant to push back darkness for generations and generations to come. No wonder there’s opposition. That hope in you is powerful. Keep hoping. Keep asking. Keep fighting. It matters. Good Morning! I just wanted to say thanks for allowing God to use you, to bring these messages of encouragement to His children. I have always had a problem with perseverance when it came to asking God for things I believed He promised. I had always assumed that if I were still praying about this situation for a month or longer and nothing happens, then that means God doesen’t want it to happen and I would just stop bringing that up in conversation with God. Thankfully, I’m learning that I have to be persitent in my pursuit and keep standing unless God says to sit down. This post was a reminder to me to keep praying and waiting for God and believing that He’s going to do exactly what He said He will do. Thanks again and have a blessed day!